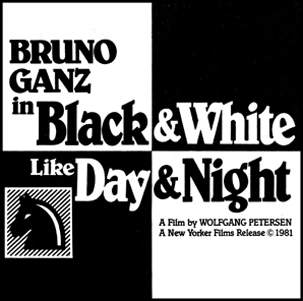 BLACK AND WHITE LIKE DAY AND NIGHT [Schwarz und Weiss wie Tage und Nächte] (1981). Bruno Ganz must be one of the greatest actors on this planet. 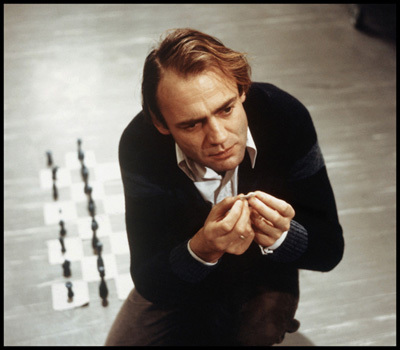 Because the German star of such high-brow must-sees as THE AMERICAN FRIEND, KNIFE IN THE HEAD and CIRCLE OF DECEIT can even turn a movie about the game of Chess into riveting psychological drama. Of course, Chess is taken much more seriously overseas -- us Americans are too busy spending billions on neanderthal football teams featuring no-necked throwbacks. What could've easily been a minor melodrama is turned inside out by Ganz's subtly deranged performance, and under its surface, the film is as much about Chess as TAXI DRIVER is about driving a cab. Ganz stars as Thomas Rosenmund, a world class champion who, even as a child, was transfixed by the game. Not exactly a good loser, little Thomas would leap across the table and attack opponents, becoming feverish from the stress of competition, until his Chess set was taken away for his own safety. But as an adult, Thomas goes back into competition for the world title against his old rival, soviet Igor Koruga. During this series of highly publicized games, Ganz gets more and more wacky. He trashes his hotel room, gets plastered, refuses to play until he receives special perks, and systematically destroys his opponent's concentration. In one surprisingly suspenseful scene, Ganz drives Koruga nuts by simply fiddling with a small, glass ball -- which may be more than it actually seems. But his trip isn't over yet. Rosenmund continues to push himself, breaking a world record by playing 60 simultaneous games, blindfolded. Then the paranoia begins. He raves that all his friends are traitors, that people are watching his home, and even suspects that his loving wife is putting arsenic in his food. As you can see, this isn't your typical feel-good sports flick. Too bad director Wolfgang Petersen (DAS BOOT, IN THE LINE OF FIRE) and his lackluster approach keep the film from greatness. Still, he manages to capture an intensity to the competition -- essentially just two guys sitting across from each other. Most of the credit goes to Ganz, who's a revelation. In the years following, he would cut a swath through European cinema, and this is one of his first and finest. He brings truth to the role, never vies for cheap sympathy and paints a tragic portrait of obsession and madness. A terrific sleeper.